Are you Doing Enough to Prevent a Major Fall Incident? When examining all of the potential costs associated with a fall, a proper fall arrest system represents an effective “insurance policy,” that offers tremendous value. After considering the human trauma and potentially fatal nature of a workplace fall, the direct costs of a fall can be seen in escalating medical insurance costs and workers’ compensation costs. After an injury causing fall occurs a Workplace Health and Safety investigation may be required that could result in fines or shut down of operations. There are also many indirect costs you might not be considering, such as lost production time expenses, the time spent to hire and/or train a replacement worker, and the downtime or lost productivity experienced with other staff as they cope with the incident. At Acculift we suggest Gorbel’s Tether Track as part of a complete fall arrest system to provide an optimal solution to protect your workers working at heights. Providing maximum protection for workers at heights with quality equipment designed specifically for the task is reassuring to all levels of the organization and to regulating provincial and federal bodies. Acculift is serious about preventing falls in the workplace and we believe this system is the most comprehensive, safe, system available in the marketplace. What are the requirements in Canada? Federally, workers above 2.4 meters are required to have fall prevention, arrest, or suppression systems in place for workers and provide adequate training on proper use of the fall equipment. You can read more Fall-Protection Systems regulations here. Provincially there may be different standards so contact Workplace Health and Safety in Manitoba and WorkSafe Saskatchewan for provincially requirements. A fall arrest system is an active means of protecting workers from injury due to falls. A complete personal fall arrest system includes an anchor point, a body harness, and a connector- such as a shock-absorbing fall arrest lanyard or self-retracting lanyard (SRL). The Rigid Rail Fall Arrest System from Gorbel is an anchoring system providing workers with a high degree of mobility and freedom, while preventing falls to lower levels. Standard systems are designed to accommodate multiple workers, weighing up to 310 pounds with tools, but can be customized to your specific needs. Available in various configurations, all systems are designed by qualified engineers to meet Canadian Federal and Provincial standards, the OSHA construction standard, as well as the ANSI fall protection code. The key differentiation of Gorbel’s anchor system is the enclosed track design, which is engineered for easy movement of the anchor point keeping as directly overhead of the worker as possible. The cold-rolled steel track keeps dirt and dust from settling on the rolling surface, allowing for smoother, more consistent ease of movement than an I-beam, with no need for cleaning or maintenance of the track, enabling the laynard to stay vertically in line with the worker. The track also features a running flange with a 2-degree taper to keep the trolley centered. That allows the trolley and attached lanyard to easily follow the worker. And a rigid rail fall arrest system stops the fall in a much shorter distance, making it the best option for low-headroom applications. With a shorter overall fall distance than wire rope, less clearance is required from the anchor point to the floor below. When the decision of choosing an anchorage point is left entirely to the worker, low points that are easily accessible may seem to be the best option. Many times, these points may be at waist or feet level, thus adding to the overall fall distance that could occur. If a lower level is located in close proximity, the worker could strike this level as part of the fall. The Tether Track system is designed for maximum protection, as the anchor point is kept well overhead reducing overall fall distance. Swing falls may occur when the anchorage point is located in an area that is not directly above the worker. With fixed anchorage points, workers may need to move a considerable distance from the anchor. Even if all parts of the system work in unison to prevent a free fall, the worker will swing back to the anchor point. If an obstacle exists between the worker and the anchor point, the worker may impact this obstruction with considerable force. Because Tether Track is designed to move with the worker and stay directly overhead, chances of a swing fall injury occurring are greatly reduced. We’ve written about it before but it’s worth mentioning again. Where it’s not feasible to get the equipment under the fall arrest system is no excuse to not have fall arrest systems in place. In these situations it is possible to take a fall arrest system to the equipment. 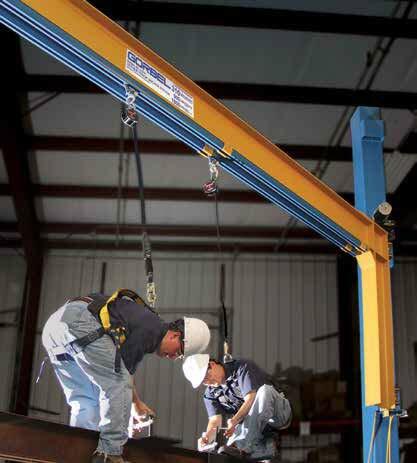 The Ranger Portable Fall Arrest System can be moved out to your equipment (rail cars, planes, etc. ), set up quickly, and provide the fall safety you need outside the normal shop environment. All it takes is one fall incident to cripple a company’s ability to operate so the best time to think about worker safety is now, BEFORE an incident. When it comes to falls, even one is too many, and to provide a safe environment for their workers all businesses should consider a managed, permanent, fall prevention strategy.